No visit home is complete without a visit to my cousin’s Rami’s spice shop. Rami and I go a long way back - Though older than I; we grew up in the same small Yemenite community in Givat Olga. As a teenager I dated one of his closest friends and we spent some memorable time double dating. He went on to marry his girlfriend, Yehudit and I moved on to other boyfriends… Since I moved to Minnesota I look forward to stopping at his store to catch up and stock up on his goodies. This last visit I stopped by with my Mom and found Rami’s son, Hod, manning the store. My mother, Orah and Hod: Partners in flavor. Colors and aromas overload my system as I walk in. Everywhere I turn my eyes encounter temptation: crates of plump and juicy dried fruit await tasting, sacks of grains, beans and rice line the wall, their mouths open for touching hands. Packaged snacks are stacked colorfully on shelves and boxes overflow with hard candy and chocolates from around the world. Rami roasts nuts on location: everything from sunflower seeds to pistachios, pecans, hazelnuts, almonds and lots more. Sometimes I get lucky and stop in at the right time. 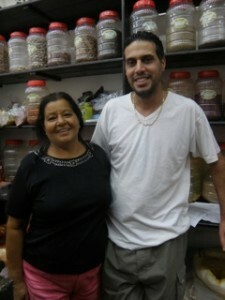 Nutty fragrance fills the street and Rami offers me samples: hot, crunchy and flavorful! 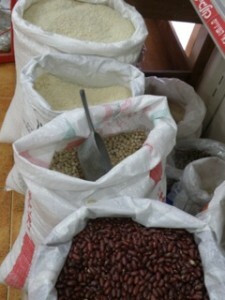 This small store serves the local community fresh ground spices, dry bulk goods and quality dried fruits. The turnover is rapid, the merchandise fresh and plentiful and the service friendly. Whether my mom and I want to make bean soup, date filling or rice pilaf with nuts and apricots – we know we can find it all there. Thank you, Rami! Wish you were closer!! For this holiday season, here is a simple recipe for lamb chops featuring a spice rub that includes some of my favorite spices from Rami’s shop. Enjoy!! Pre-heat your grille or broiler so it will provide a nice char. Mix together garlic, cumin, turmeric, paprika, pepper flakes and olive oil in a medium bowl. Pat the lamb dry with paper towel and then rub spice mixture evenly over both sides of lamb racks. Season racks with salt and pepper and let racks sit for 10 minutes. Place rack on medium-high heat on grille (or under broiler) and cook for 4 minutes. Turn racks over and cook for 4 minutes longer. Use an instant read thermometer: Medium -rare is between 130-140F, 140-150F is medium. Let racks rest for 5 minutes, covered. Slice rack into chops at the joint and serve immediately. For a Middle Eastern dinner serve with basmati rice and char-grilled tomatoes and onions.